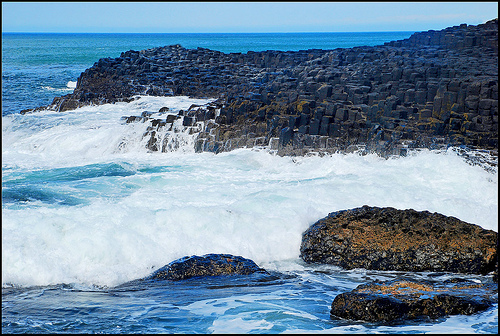 The area known as the Giant’s Causeway is the only UNESCO World Heritage Site in the whole of Northern Ireland. It is something that needs to be seen to be believed. It was created during a volcanic explosion which left behind a wide expanse of columns of polygonal basalt. The causeway has been attracting people to the region for centuries and is included in many myths and legends that relate to the area. Lava forcing its way through the chalk bedrock led to the formation of a lava plateau. The causeway itself was fully created over three separate volcanic events creating three basalt layers, the lower, middle and upper layers. The layer that we recognise as the causeway with its angular rocks and columned amphitheatres is formed by the middle basalt layer. This is a place that is heavy with myth and legend. There are stories that claim that the causeway was carved by tools in the hand of the Irish Giant Finn McCool, as were many of the other natural geographical features of Northern Ireland. The causeway is a fantastic place to go sea bird spotting and find some unusual and even rare plants which can be found nestled in the nooks and crannies of the various rock formations. There are scheduled guided tours of the causeway should you wish to discover more about it, but it is a fantastic place to go for a picnic by the sea. The new visitor centre here has been specially designed to blend into the unique landscape of angular rock formations, in fact columns of basalt have been included in the design to achieve such an effect. It houses a number of different exhibition areas and from the eco friendly grassed roof of the centre you can take in a full 360’ view of the coastline that makes up the Causeway. The centre is filled with many interactive displays which the kids are sure to appreciate and you may even run into the giant himself and learn more about how he came to be responsible for this incredible landscape. This is an area that is subject to conservation work and a lot has been done to make the centre a viable and sustainable eco friendly resource, the equipment that you will find inside is state of the art and quite unlike anything you will have encountered before, offering you a unique visitor and learning experience to this incredibly unique part of Northern Ireland. Take a break from your exploring and enjoy a break in the new café located inside the visitor centre. Browse the local wares that are available to buy in the new retail outlet, products that are currently unavailable anywhere else. Of course you can visit the causeway without using the services of the visitor centre. If you wish to explore the stones yourself you should park your car in the car parking close to the railway station (£6 per day charge) and then find your own way to the stones. For those wishing to walk the stones there are a number of different walking trails that have been marked out and colour coded for level of ease. The trails offer a path over the stones for people of all levels of ability and offer some spectacular views of the cliffs and bays.